Irritable hip, also known as acute transient synovitis, is a common disorder of childhood characterized by the onset of hip pain and limping. The term transient means that it does not usually last long. Irritable Hip usually occurs before puberty and affects only one hip. Boys between the age of 4 and 10 years are affected 2 to 4 times more than girls. The exact cause of irritable hip is unknown. However, in some cases, the condition can occur because of a viral infection (upper respiratory tract) or a fall or injury. Irritable hip can also occur because of Perthes disease, a condition where the head of the thigh bone deteriorates because of poor blood supply. The Treatment of irritable hip includes medications and bed rest. Painkillers or anti-inflammatory drugs (called NSAIDS) are prescribed to help relieve pain and reduce inflammation. Your doctor may prescribe some specific medications depending on the type of infection detected. 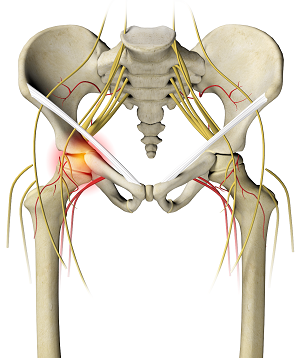 Applying heat and massaging the affected hip may also help in reducing hip pain.